Part I of my Foreign & Domestic series was actually born out of non-fiction cooking and entertainment book I wrote with a friend of mine, who also happens to be a chef. As a result of the cookbook, I became keenly aware of what my family was ingesting and was noticing drastic changes in the rates of incidence for neurological and gastrointestinal issues in society in general. Part I addresses these issues and then some. The second edition of Part I was released on August 3, 2014. This new edition is the result of professional review and editing. Changes include the tightening up of several storylines, the shuffling of vignettes within chapters, and the removal of aspects that readers felt were too un-relatable, coincidental, and/or bordered on the sci-fi. Some of the critical parts that I didn't want to lose and that I felt were important to the story I wanted to tell were incorporated and moved to Part II of the series prior to its release. Deep inside the halls of Congress and corporate boardrooms, the fate of the American agricultural system hangs in the balance. Small town America is a mere afterthought to the backdoor dealings that will hit closer to home than you might think. When greed, collusion, and corruption collide in the skies above him, Josh Simmons, his daughters, and their self-sufficient lifestyle are thrust center stage for all the world to see. The timing of it all couldn’t have been worse. Can the manna from Heaven in the form of a stranger help keep the world at bay and save his tormented soul? Can they pick up the pieces from his failed marriage and suppress the demons from the barbarism he experienced as a POW? Hang on for a wild ride through America's heartland as Josh and friends try and do the right thing when society's material and individualistic mentality says they ought to ignore the injustice and turn a blind eye. 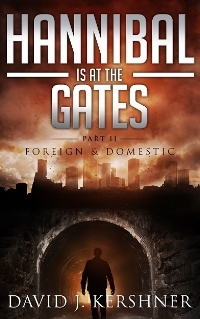 Part II of the Foreign and Domestic series picks up right where I left off in Part I. Colonial adversaries are attempting to take advantage of the U.S. while we are seemingly at our weakest... what better way to do that than to crash our financial system! As with anything I write, there's always more to it than that as we also have a new full blown threat from some nefarious actors. Josh Simmons and his family have been reunited just in time. America's empirical enemies are standing at the gate and a new subversive foe, bent on a holy war, has entered the game. Foreign insurgents have crossed the porous southern border and are running roughshod through the countryside with a new weapon not previously seen on the battlefield. Food riots and rationing have gripped the nation for over six months while aristocratic diplomats eagerly work to take advantage of the United States when it's at its weakest. With the nation teetering on the precipice, Josh has never been happier. He's got the love of his life in Samantha, his three daughters, and has managed to surround himself with numerous friends in preparation for the coming storm. Can he protect the people he loves the most as the nation descends into chaos? Part III of the Foreign and Domestic series jacks up the tempo and the action and never lets up. So many questions remain unanswered from Parts I and II that I leave myself a 360-degree field of view in terms of where the multiple storylines might go. Can the group stop plans for a world dominating caliphate from coming into existence? What new perils are locked away in Surhab's twisted mind? Can the security of McArthur, Ohio be maintained by Josh and others if for no other reason than to protect the secret it now holds? It’s been years in the making, but wedding bells and the return to a simple normal life are finally on the horizon for Josh. The food system and financial capacity of a once great nation are in ruins, but he’s content for the first time in over a decade. Unfortunately, his wedded bliss is defenseless against the plans set in motion by the Esfahani brothers. Can Gregg and Hoplite extract the information from Suhrab in time? Can they stop their plans for a world dominating caliphate from coming into existence? What new perils are locked away in the prisoner’s twisted mind? Can the security of McArthur, Ohio be maintained if for no other reason than to protect the secret it now holds? Part IV of the series jumps 20 years into the future from the conclusion of Part III. We've had our little electrical disturbance, but that has led to a trinity of destruction, chaos, and mayhem. The United States is just coming out of the darkest period in its history only to find a ruthless President willing to do anything to maintain his grip on power. New characters take center stage, with a helping hand from Josh and friends of course. Fear not dear readers, I supply plenty of moments to fill you in on what happened during those 20-years! Over twenty years have elapsed since the EMP and the country still isn't in good standing. Fear, panic, and anger immediately ripped through the country until the nation was fully engulfed in a Second Civil War. Just as the hostilities were dying down, Governors began joining forces and employing militias giving rise to the regional Clan Wars. Region states began actively hunting for the heads of patriots that had honorably fought to stave off the UN forces. Hundreds of thousands were 'disappeared', many went into hiding. The last of the warring came to a vicious end in the Northwest Territory roughly ten years after the first detonation appeared in the pre-dawn sky. As agreements were being struck between the regions, a lone shadowy figure stepped in and usurped national power. A well-placed munition not only relieved the country of the sitting President but his predecessor as well. Stealing elections became a way of life as a former gang banger from the Bronx assumed the Presidency. For twelve years, what was left of the American people suffered under the despotic aims of President Alejandro Calderon’s oppression. Unable to bear anymore, many are now ready to rise up and throw off their bonds of servitude and start the American experiment anew. The people were finally ready to fight back. All they needed was someone willing to lead. Part V of the series brings the saga of the Simmons family to a stunning conclusion as the showdown between Josh and the despotic POTUS looms. Josh's last remaining goal in life is to return The United States of America to a democratic republic or die trying. The Dictator in Chief, President Alejandro Calderon, continues to make life miserable for any and all surviving Americans. A new ruling class has been anointed and is fully entrenched in enclaves across America. The administration's enslaved masses labor and toil and tend to their every need in exchange for the oxygen needed to stay alive. Unbeknownst to Calderon, Josh and his ragtag band of patriots are headed straight for him. They know when and where he'll be, but can they make it there in time? Will they be able to remove an authoritarian oligarch and his administration without plunging the country into another Civil War? Read the thrilling conclusion of the Foreign and Domestic series, A Time for Reckoning, to see who survives the ultimate showdown between the hunted patriots and the man who wants them all shackled and kneeling under his socialistic yolk. This cooking and entertainment book was the catalyst that started the Foreign & Domestic series. The first half of the book attempts to humanize the authors as much as possible by explaining our own personal entertainment failures. In so doing, we worked to remove the fear and anxiety some people feel towards entertaining in general. The second half of the book contains 12 complete menus (apps, soups/salads, main dish, dessert etc.). Each menu also contains a wine pairing which was provided by Sommelier.